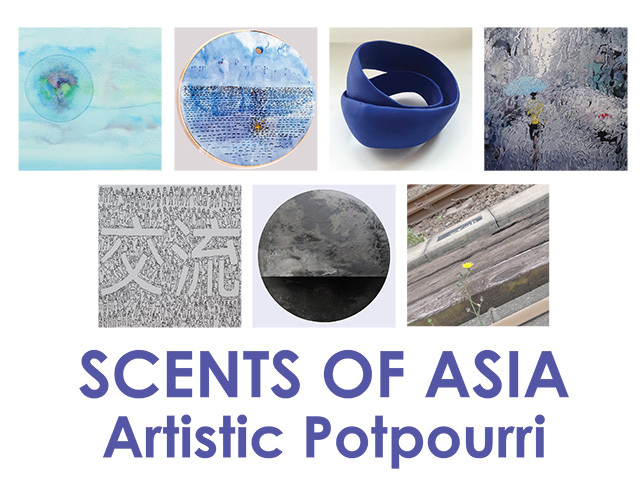 Scents of Asia is a group show with artworks by Nicola Anthony, Eddie Botha, Claire Deniau, Hélène Le Chatelier, Marc Nair, Tania Nasr, Pang, Soe Soe. The exhibition encompasses watercolours, acrylic, mixed media paintings, ceramics, installations and artists books. Scents of Asia is the second edition of a summer group exhibition dedicated to showcasing a selection of Intersections’ best talents. Potpourri refers to a scented mixture of spices and dried flowers that is usually kept in a decorative bowl or jar and used to perfume a room. Potpourri also applies to a collection of seemingly unrelated items, to an unusual assortment. The objective of this potpourri is to create a mosaic of artworks which altogether make sense. The artworks in this show have been selected to be in mutual resonance aesthetically and conceptually. Most of the artworks are monochromatic landscapes. Circular shapes are used to invite the viewer to look closer and deeper. They refer to cultural interactions, the sea and the monsoon.